This review is a part of the 'Casual Collection: November 2011 New Releases' article. Left at an orphanage as an infant, Esther has no link to her origins save an ornate rattle and a medallion, plus frequent nightmares of a strange mansion and an ancient oak tree. On a hazy day in 1830, she receives a letter from a distant aunt urging her to return to her estate, not only to learn more about her illustrious ancestors descended from Merlin the wizard, but also to prevent a power-hungry witch from escaping the magical container built by her family. Artifex Mundi's Time Mysteries: The Ancient Spectres starts in earnest as Esther reaches the abandoned, decrepit mansion – the same one from her nightmares – and discovers the crystal cage which she must keep from cracking by finding magical tokens scattered across Europe and time. This sequel to Inheritance is loosely linked through the Ambrose family tree: Esther is the grandmother of Vivian, the heroine of the first episode, who travelled through time to rescue her father from the clutches of his kidnapper. But The Ancient Spectres is far superior in both complexity and production quality to its predecessor, which used time travel as a mere plot device to generate diverse visual backdrops. Here, time and space are linked intricately through action and consequence, and Esther must constantly flit between both to achieve her goals, whether collecting items from one century to use in another, setting up events that yield results years later, or gathering clues and objects from past versions of the mansion even as the witch progressively destroys it in the present day. The main adventure has about a dozen hidden object screens and as many logic puzzles interspersed with numerous inventory quests to collect tools and puzzle parts, all taking over five hours to complete. The hidden object searches are quite challenging, with attractive, detailed screens smartly stocked with era- and situation-appropriate items, some of which require minor interactivity. These screens are revisited twice each, but all previously collected items are excluded from later searches. Besides the rechargeable hint, a 'sonar' feature helps by showing silhouettes of the listed items. Interestingly, if you don't feel like trawling the search screens, you can opt for an addictive symbol-matching arcade game to move ahead. The standalone puzzles are simple and cover the usual gamut of jigsaws, rotators, and pattern- or image-matching, but are nevertheless entertaining as they're well-integrated with the story. One that requires lighting a city's streets is especially elegantly designed. The backbone of the game, however, are Esther's tasks to locate objects and create situations by teleporting between the Ambrose estates in London and Venice over multiple centuries using the time machine, like the clever quest to produce a bottle of wine. These add genuine complexity to the linear flow, and the sense of accomplishment as minor activities significantly alter the future is satisfyingly real. Unlike Vivian, Esther has no wisecracking sidekick; instead she must rely on the letters and instructions strewn about, which are archived in her journal along with her objectives. The time machine also serves as an interactive map, marking out locations – across time – where tasks are pending, and those which have changed since Esther's last visit. By allowing teleportation to specific destinations, this invaluable facility eliminates the tedious legwork that cripples most casual games. The attention to detail extends from the plot and puzzles into production as well. The richly coloured scenes reflect their eras and moods, such as the Venetian mansion in the grips of the plague or its British counterpart crumbling under the witch's onslaught. Comparing locations through the centuries is a delightful pastime in itself. Ambient animation, like wavering sunbeams and footsteps on dusty floors, is subtle and efficient, as is the orchestral score, which is lovely in parts and ominous in others. Cutscenes are spectacular, be it Esther's nightmares, the witch running amok, or the release of fire-moths from the crystal cage. The time machine animation is also sleek and never gets stale despite many repetitions. Unfortunately, the screens are annoyingly cluttered with multiple hotspots (and repetitive comments) for non-essential elements that are never deactivated, resulting in a lot of extra clicks. Conversations and cutscenes are expertly voiced, though in-game commentary is text-based, with coherent, easy-to-follow dialogues. While the main game ends with a blazing cliffhanger and the announcement of a sequel, the Collector’s Edition returns to the past for a complicated half hour story of a woman trying to save both infant and adult Esther from her fiery predicament. Along the way, she must repair the time machine, visit an outlandish lab and a herbalist's hut, and solve a handful of easy minigames. A notable exception is a poorly clued, visually and mentally taxing pattern-matching puzzle that may make you grateful for the skip button. The bonus chapter has four more repeating hidden object searches, and is a fairly unnecessary extension of play time unless one is really keen to learn how Esther arrived at the orphanage or manages her predictable present-day escape. A unique extra is an encyclopaedia of key characters and objects, though having it on hand while playing may have made it a more useful reference. 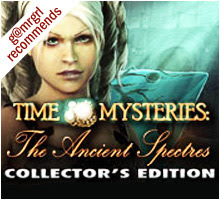 Time Mysteries: The Ancient Spectres is most certainly another very good game from Artifex Mundi (immediately following the stellar Enigmatis: The Ghosts of Maple Creek). Its fantasy-based story is laid out plausibly and ties in actual historical events, the reasonably challenging gameplay flows smoothly and stays aligned with the plot, and the production is largely superlative. But what elevates it to a great game is the way it links its core time-travel concept into the gameplay to create an experience that is complex and thought-provoking beyond the pretty window-dressing. It connects actions to consequences with rare rationality, and is confident enough of its own potential to avoid deceiving players with unnecessary backtracking and ill-informed quests, making it a casual adventure that's well worth your time. 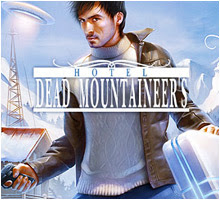 summary: The long-awaited Dead Mountaineer's Hotel is finally open for business, but the pointless quests, clunky gameplay, exhausting backtracking, subpar production quality and absence of a coherent plot will surely leave you cold.